Cherry was a most gracious host. The room was very clean, modern, with nice decor. It had a nice balcony with a view. It was in the newer part of town and about a 10 minute walk from the train station. It was another 5-10 minute walk along the coast to the older town center. We loved the quiet location with the frogs chirping at night and birds singing in the morning. Room was cleaned and Bedding and towels were changed daily Fresh fruit and bottled water were provided in the room. A nice variety of good food was available for breakfast, even when we had to leave to catch a train before 7 am. We were traveling light, so the 176 even terra cotta steps from the street to the room was not a problem for us after hiking from Vernazza. Grazie for a great stay, Cherry! 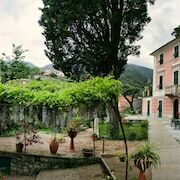 Property is right in the heart of Old Town Monterosso on Via Roma. I was able to walk everywhere. Within five to 10-minutes walks are the post office, a bank, a laundry, money exchange, the train station, entrance to several trails, Cinque Terre bus stops, Church of San Giovanni Battista, outstanding shops with local artisans' products, excellent restaurants and the sea. Stefania and Giovanni are gracious and professional hosts. Connie (housekeeping), provided an extremely clean room. As a single female traveling alone, I felt safe, yet pampered and still permitted my privacy. It was a perfect accommodation in a perfect location for my long Easter getaway. Thank you so very much! 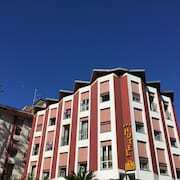 Where to find Monterosso al Mare hotels near an airport? How can I find hotels in different Monterosso al Mare neighborhoods? Where can I find hotels in Monterosso al Mare that are near tourist attractions? 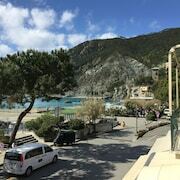 When planning your Cinque Terre - La Spezia sojourn, there is a wide range of great accommodation options in Monterosso al Mare. 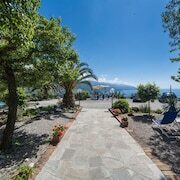 Our accommodation section lists 90 accommodation options within 0.1 kilometres (0.1 miles) of Monterosso al Mare's heart. Would you like to find a bed close to the action in Monterosso al Mare? 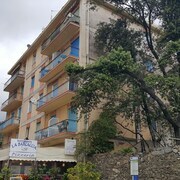 The Affittacamere Monterosso 5 Terre and Affittacamere I Coralli can be found within a short distance of the city center. The Hotel Porto Roca and Villa degli Argentieri are closest to Monterosso Beach, while the Villa Accini and Hotel Suisse Bellevue are near Fegina Beach. Those who are traveling to Monterosso al Mare for Beach Bar Stella Marina could book a room at your choice of the Affittacamere Da Cesare and Hotel 5 Terre. And, if your focus is on 5terre Massage, your closest hotel options are the Hotel Punta Mesco and Affittacamere Lo Scoglio. 25 kilometres (16 miles) away from the main part of Monterosso al Mare, is the Eco del Mare Night and Day Beach Club. Alternatively, the Piccolo Hotel Del Lido can be found 20 kilometres (12 miles) away. You could also book a room at the Park Hotel Argento or the Hotel Vis à Vis. Like to travel a little further afield? Liguria has many options. Check out Liguria's ruins, castles and traditional villages or photograph its rural landscapes and beaches. In this section of Italy, travelers can also enjoy skiing, mountain biking and rock climbing. Borgo Antico is 1 kilometre (1 mile) to the south of Monterosso al Mare, and is home to the Cantina du Sciacchetra and Footpath Monterosso-Vernazza. 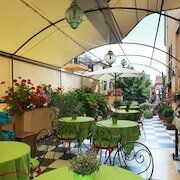 The Hotel Al terra di Mare and Villa Cinque Terre are a few of the accommodation alternatives in Borgo Antico. 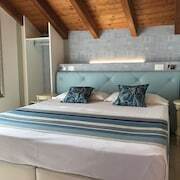 Or, you could stay in Vernazza, 4 kilometres (2 miles) to the southeast of Monterosso al Mare, where you can choose from the Appartamento Cinque Terre Holidays and Giovanni Rooms. Regardless of whether you're passing through or spending a few nights in Vernazza, be sure to check out Vernazza Beach and the Vernazza Ferry. Cristoforo Colombo Airport is a practical airport for Monterosso al Mare travelers, and is 70 kilometres (43 miles) from Monterosso al Mare. Nearby hotels include MarinaPlace Resort & Spa and Tower Genova Airport Hotel & Conference Center. 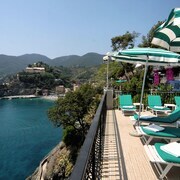 What are the most popular Monterosso al Mare hotels? Are there hotels in other cities near Monterosso al Mare? 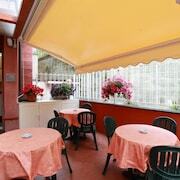 What other types of accommodations are available in Monterosso al Mare? Explore Monterosso al Mare with Expedia.ca’s Travel Guides to find the best flights, cars, holiday packages and more!